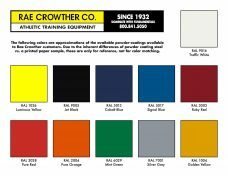 ELITE ATHLETE RACK - Rae Crowther Co.Rae Crowther Co. 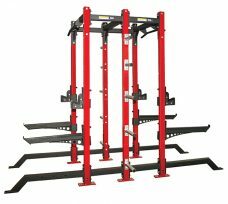 The Elite Athlete Rack (E.A.R.) is made for the coach and athlete who want to maximize their training space with ground based exercise movements. The E.A.R. 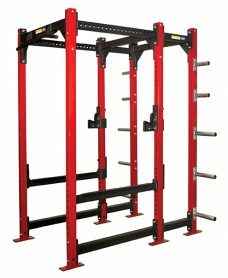 is the antonym to the expensive and bulky power rack. 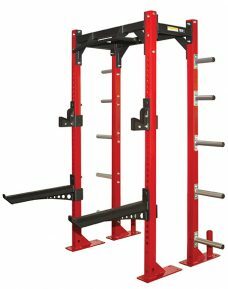 With the E.A.R concept the weight room can be simplified, space efficiency greatly increased, and costs reduced. The E.A.R. allows more athletes to train simultaneously. 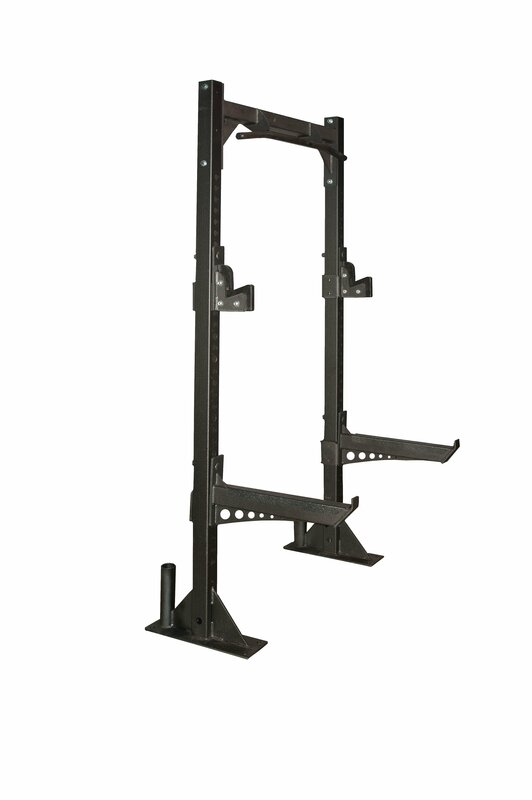 The E.A.R is made from 11 Gauge structural 3” steel tubing. The uprights are lasered with 1 1⁄8” holes that allow 2” bar catch adjustments. Numbers are laser cut on both sides of the uprights. Lasered numbers will not wear out like panels or decals. Each upright has 20” x 6” x 3⁄8” welded base plates. All base plates have welded gussets for strength. Each base plate has 4 holes for mounting into the floor (the rack must be bolted into the floor, not free standing). 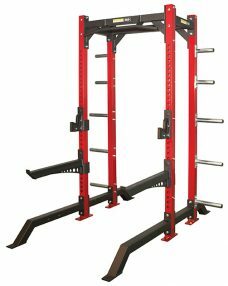 Standard are two Patriot Deluxe Bar Catches with 34 adjustments per upright. The catch is a “sandwich” style bar catch with 1” thick ultra-high dense plastic in the middle. The metal is lasered cut and formed. The bar rests on the plastic and never the metal. The lifter has 3” of plastic to rest the bar. The interior of the catch is protected from the upright with a plastic sleeve. The cambered Chin Bar is made from 1 3⁄8” metal rod with rubber grips. The chin bar has two wide interior parallel grip areas. The Chin bar connector is gusseted and welded with large end plates for extra strength. Standard are two (2) heavy duty safety bars (safeties are painted matte crinkle black). Each bar is 24” in length. Each safety has hard plastic protection on the top of the metal. The plastic is secured with button head bolts and not glue. Each safety is made from 3” structural steel tubing and gusseted for extra strength. Powder coated in matte crinkle black. Kept in stock for fast delivery!